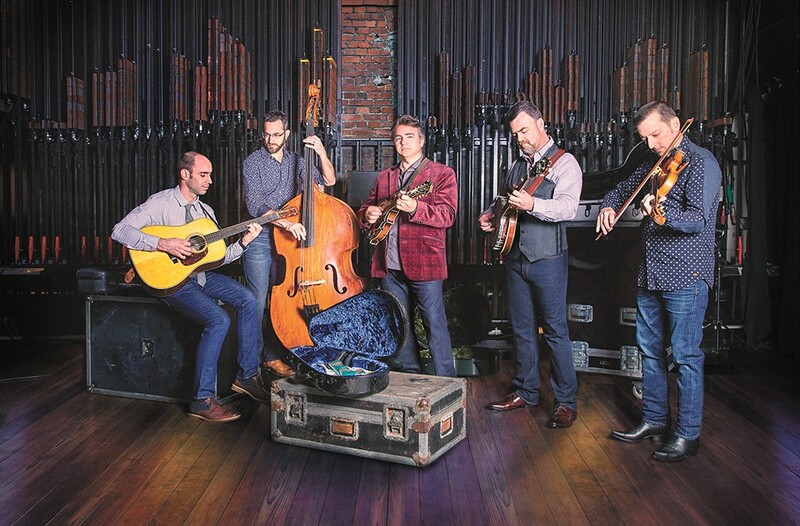 The Travelin' McCourys are bluegrass lifers with a knack for both traditional and progressive tunes. When it comes to roots music, it doesn't get much more rootsy than the bluegrass aces of the McCoury family. Daddy Del McCoury is a towering figure of the genre thanks to a remarkable high-lonesome voice, and a rhythm guitar style that earned him a gig in the early 1960s as part of legend Bill Monroe's Blue Grass Boys and keeps him on the road headlining nearly 70 shows a year. And when Del plays, he's surrounded with a longtime band of great musicians that includes his fleet-fingered, mandolin-playing son Ronnie and banjo-man son Robbie, as well as fiddler Jason Carter and bassist Alan Bartram. Here's the thing, though — Del McCoury is 79. He's not going to be performing forever, and he was thinking about that when he sat his sons down about 10 years ago and talked about life after the Del McCoury Band. Out of that conversation, the Travelin' McCourys unit was born. "My dad had the idea," Ronnie McCoury says from his home, just north of Nashville. "He was kind of looking at life and longevity, and he said, 'You know, if something might happen to me, you guys are going to have to start cold. So maybe you should get out and try and do some things.' He kicked us out of the nest." Musically speaking, the change wasn't too hard. The guys in the band — including the semirecent addition of guitarist Cody Kilby — are all veteran players who've collectively won all manner of awards from the International Bluegrass Music Association for their instrumental prowess. Ronnie McCoury, for example, won the Mandolin Player of the Year award eight years running at one point, and Carter won Fiddle Player of the Year five times. Emotionally, though, the idea of hitting the road and performing without Del took some getting used to, Ronnie says, and still does even after eight years of doing Travelin' McCoury shows between gigs with Dad's band. "I'm 50 and I started playing with him when I was 14," Ronnie says. "My brother is a little younger than me and did the same thing ... The first time we heard this [idea], it was awkward. Just to know he was thinking that way, you know? Because none of us ever thought that day would ever come." For a while, the Travelin' McCourys didn't hire a full-time guitar player, instead rotating through friends they've met through the years (Tony Rice, Dan Tyminski of Alison Krauss & Union Station, Bill Nershi of String Cheese Incident). When they decided to get a permanent six stringer, they recalled an early Travelin' McCourys show they did with Cody Kilby, then with Ricky Skaggs and Kentucky Thunder. With Kilby in the fold, Ronnie says, the band has reached a place where they can stretch out together and explore some sounds that might not have been possible either in Del's traditional songs or without the same guitar player on board night after night. "We're able to do a lot more ranging; it took [hiring Kilby] to really lock in on what we're doing," Ronnie says. "And when I sing, I open my mouth and I can't [help] but sound a lot like my dad. So I do some singing, Alan Bartram is a great singer, Jason Carter is a great singer, and this [project] kind of allows them to step out more." The idea of these guys pushing themselves into new musical realms should be thrilling for any bluegrass fan, or anyone who likes seeing masters of their musical craft do their thing up close. The first time I saw Del McCoury Band play about 20 years ago, it was a transcendent experience, one that made me a lifelong fan and pushed me into exploring various strains of bluegrass and roots music I hadn't before. The remarkable thing is, no matter what direction you search in bluegrass and its myriad offshoots, you'll find the McCourys. In the same year, I saw them play in natty suits, gathered around one microphone, old-timey style, doing traditional tunes in a staid theater, and a few months later they were jamming with the band Leftover Salmon on a nightclub stage, thrilling an audience of patchouli-soaked snow hippies with their ability to improvise. Through the years between their own gigs, they've recorded, toured and collaborated with the likes of avant garde noodlers Phish, roots-rock rabble rouser Steve Earle, New Orleans jazz cats the Preservation Hall Jazz Band and bluegrass-minded country folks like Marty Stuart, Ricky Skaggs and Vince Gill. Through every twist in their lengthy career, including this new one playing without Del out front, they've had smiles on their faces and magic in their strings. Nitty Gritty Dirt Band, Will The Circle Be Unbroken? The original print version of this article was headlined "Pickin', Grinnin' and Utterly Thrillin'"